Cats need to groom themselves in order to stay clean and survive. So we already mentioned, cats love to be clean, but the truth behind it, they not just only love it, they need to be clean, in order to survive. Cats are hunters, and if the parts of their prey are remaining on their coat, they will soon start to rot, and other animals will sense the scent over a distance. There’s no need to guess how successful the cat’s next hunting attempt will be, if this happens. Getting rid of loose hair. Cats do shed, and, while, in a household environment, most cats shed all the time, in natural conditions this is seasonal, and after the winter, cats shed excessively. So, in order to avoid dead hair in the coat, as well as sheets of fur dropping all around the nest, thus causing unnecessary attention, cat has to lick all the dead hair out, and, most of it gets ingested. No worries about hairballs in natural conditions, though, as the moisture in their natural diet helps to pass fur through their digestive system easily. For cats on dry food, though, regular brushing and use of anti hairball lubricant paste would be necessary. Or simply, you might switch your cat to a wet or raw food. Find more info about cat hairballs here. As a stress relief, if we want to simplify this matter. It’s very common that cats groom themselves excessively because of stress. Have you ever seen a cat embarrassing himself? This is usually followed by one or two licks of their paws, which is done to pull the thoughts together and to drive attention away from what just happened. But that’s not the only case when cats groom themselves in order to relief stress. This behavior is called a displacement activity, and is done in order to make use of energy that may not be used for it’s intended purpose. Like seeing bird trough the window and not being able to reach it, or encountering a cat but not being able to decide whether to attack or to run away, or simply when the surroundings are too stressful. 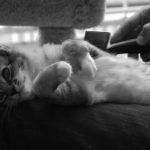 This evaluates to one important observation – if your cat is grooming himself too often, it’s possible he is under the large amount of stress. Read more about stress in cats here. Bonding with other individuals. In most cases grooming someone else is directed towards other cats, but it’s not a rarity when cats groom dogs, other pets and people. This serves for two purposes as it helps to stay clean, as well as provides a possibility for social bonding. Mother cat grooms her kittens in several occasions. It helps to remove afterbirth fluid, it helps to guide the kitten to her teat, it helps to keep the kitten clean during his childhood, as well as it helps the kitten to pass his wastes, as, if you did not know, kittens are not able to defalcate themselves voluntarily during their first weeks of age. 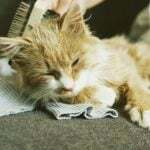 Even though cats are clean animals, and groom themselves a lot, in most cases, cats living in household environment require regular grooming. How often, it depends on your cat. Long haired cats may require it every day, while shot haired cats may easily go with doing it only when there’s too much hair on your clothes. Read more about cat brushing here. 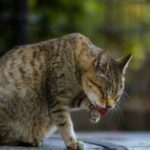 Why is your cat constantly licking itself and losing hair?